Dutch yard Royal Huisman has relaunched one of the world's largest sailing yachts after completing an extensive winter refit. The three masted 93 metre Eos, which arrived at the yard alongside the 90 metre schooner Athena last year, has emerged following her refit. Work began on the Lurssen schooner yacht, which was refitted at the yard’s deep seawater refit division Huisfit in the Netherlands, in November last year. This included the removal, inspection and repainting of her Rondal rigs. The hull and superstructure of Eos were also repainted and varnished, while the tank arrangement was reorganised. The 2018-19 refit programme also included a major overhaul of the MTU 4000 series main engines and a rebuild of all three gensets. The shaft lines, gearboxes, thrusters and stabilisers were also overhauled and serviced while the rudder and rudder motor received a full service. Various on board systems including the watermaker, treatment unit, bilge and fuel separators were also serviced. Eos was delivered in 2006 and was designed by Bill Langan with interior design by Francois Catroux. 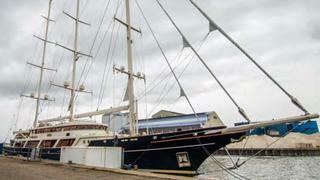 She can accommodate up to 16 guests and 21 crew members.